Typical applications: A capacitive sensor is typically used as empty, full and level indicator in tanks, silos and containers for example with: grain, feed. Control of filling and emptying. The powerful integrated relay means that it can control many functions directly. 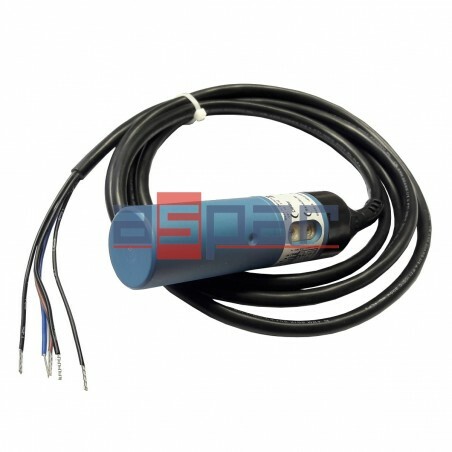 A capacitive level sensor with relay output 5A DC; 2A AC and disconnection delay. Power supplu: 10~30VDC/AC. Diameter of sensor 30mm. The powerful integrated relay means that it can control many functions directly. The use of electronic rather than mechanic switches ensures a unique reliability, particularly as the electronics are completely encapsulated in special plastic, which provides maximum protection against humidity and other external influences in harsh environments. e phone) and transients (i.e. from motors and contactors). This makes the sensor very reliable. The detection distance of the DOL 44R sensor depends on the material and the sensitivity can be set in the range of 0 - 15 mm. When the load stops, the time delay starts. Time delay is adjustable 0-600 sec. Factory setting: 30 sec. A red LED clearly indicates the current status of the relay sensor. The level sensor DOL 44R is made in a sealed plastic housing, protection class is IP69K. Time delay Adjustable 0-600 sec. Factory setting: 30 sec. Safety Relay switches and supply voltage are galvanic separated. Test voltage 4 kV AC. Cable 5-core 0.75 mm 2. Length 1500 mm / 58.5 in. Diameter 9.1 mm / 0.35 in.